Add Olive Oil to Large hot non-stick skillet on Med-high Heat. Saute mushrooms 2-3 mins. with minced garlic. Add and Sear Arborio Rice with mushrooms for about 2 mins. Slowly add 1 c. of vegetable broth. Bring to Boil. Slowly add small amounts of broth about 1/4 c. at a time until rice is cooked (about 25 mins total). Keep stirring to make sure risotto doesn’t scorch. Cook on med-high heat. Add a big pinch of celery salt and a big pinch of onion powder to pan. Add a handful of chopped spinach. Add 1/2 c. of peas. Cook until rice is thoroughly cooked, but not overdone. Serve with a yummy green salad! Did you try out this recipe? Let me know your thoughts! Also, don’t forget to Follow MyStyleSpot on Twitter and Facebook for more yummy vegetarian/vegan recipes! 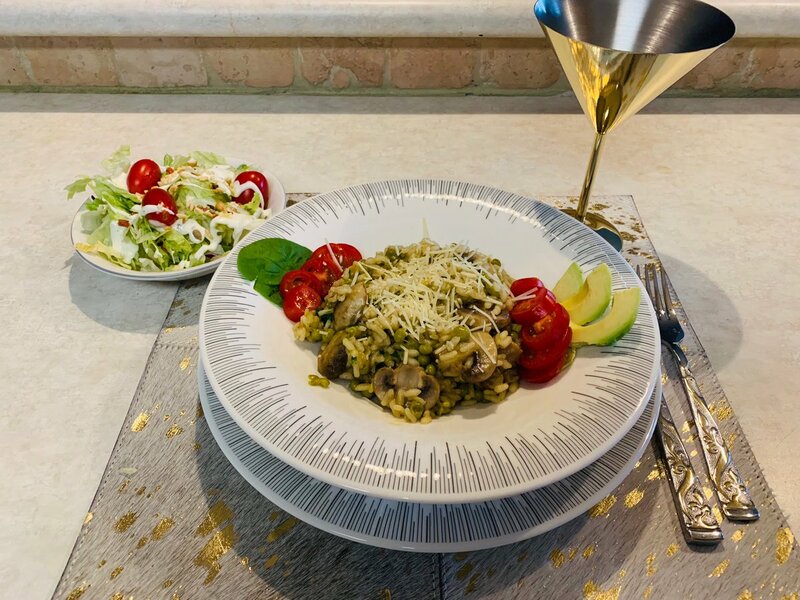 I love mushrooms and I love risotto, so the combo has to be great. This sounds delicious.